Clip-on LED Selfie Ring Light: You would just have to carry this around in your purse or put it in your pocket to record all your happy beauty moment in your lifetime when you are in party or outdoor activities. It is Rechargeable with 3 Brightness Levels and 36 Long Lasting LED. Press the power button, you will be able to switch to another lighting level. 36 LED bulbs will be able to provide enough lighting for you to take great selfies. Universal ring flash light-Compatible with most Smart Phones/Tablets.USB Rechargeable selfie lightThis selfie ring light which built-in rechargeable battery-saves you money. You can recharge it with computer / power bank / wall adapter etc . 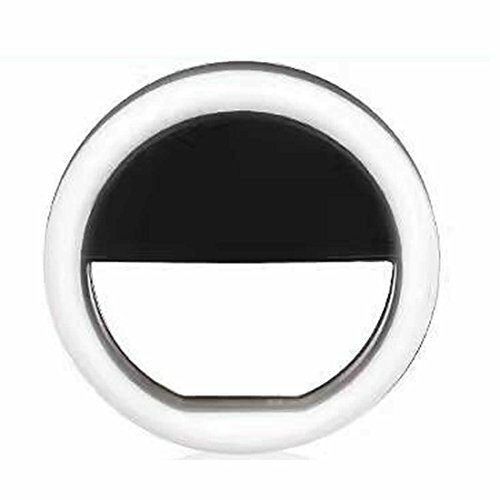 [Feel Free to USE]: The clip on selfie ring light has a rubber bumper that helps protect your phone from scratches when clipped on, just feel free to use it and take it with you anywhere you go and record all happy moments in your life. If you have any questions about this product by COOCLE, contact us by completing and submitting the form below. If you are looking for a specif part number, please include it with your message.